Verizon Motorola Droid 2 Launching August 12th? It's the end of July, and August is literally right around the corner. One of the things we're looking forward to the most is the Droid 2, and finally getting some official photography taken of the device. Plus, our hands-on time (that should be obvious). 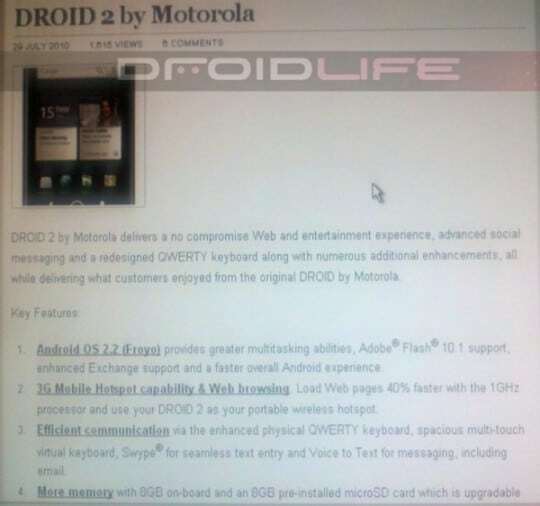 The release date of the device has been one of the best kept secrets within Verizon since its debut months ago, but now it looks like a recent leak from a Verizon internal screen shot shows that the Droid 2 is coming August 12th. This can't be confirmed by any means, and we're sure that just because this is making its rounds over the Internet, it doesn't mean that they are going to break their obvious game plan and announce anything sooner than they already planned. But, if the device does indeed launch August 12th, that puts it right near the middle of the month, and that tells us that an update to the Droid X to Android 2.2 at the end of the month, or right around the 15th, would make perfect sense. Here in just a few days, we'll probably have all the necessary answers.